Richmond International Airport, VA (November 16, 2018) – Every holiday season, Richmond International Airport (RIC) prepares to ensure we provide a smooth travel experience for all our customers. 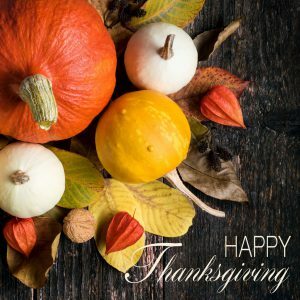 With Thanksgiving signaling the start of the holiday travel season, RIC recommends passengers follow these travel guidelines for a safe and stress-free travel experience. Arrive early: Travelers are strongly encouraged to check in at least 90 minutes prior to departure. Once checked in, proceed directly to the security screening checkpoints. 40 minutes prior to departure, travelers should be at their departure gates, ready to board. Learn more about security screening. New TSA screening procedures for carry-on electronics: Per the TSA, travelers must remove ALL electronics larger than a cell phone from their carry-on bags and place them in a bin with nothing on top or below, similar to how laptops have been screened. This simple step helps TSA officers obtain a clearer X-ray image. ​Remember, it’s 3-1-1 for liquids: Liquids, gels, aerosols, creams and pastes must be 3.4 ounces or less and all bottles must fit in one quart size plastic bag and placed in a bin for screening. This includes sun block and tanning sprays. One quart-size bags is permitted per person. Check for prohibited items: Use the “Can I bring my…” feature on TSA’s website to check what items are allowed/ not allowed in carry-on and checked luggage. 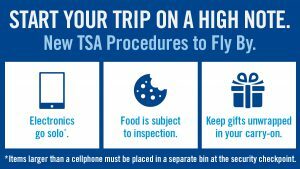 Smartphone users can easily download the free “MyTSA” app for that feature and to find additional helpful information about TSA policies and procedures. Prepare for security: Have an acceptable ID and boarding pass out and remove electronics, including all electronics larger than a cell phone, and the 3-1-1 compliant liquids bag, from carry-on baggage. Gifts: While wrapped gifts are allowed, security officers may need to unwrap a gift to resolve an alarm. TSA recommends passengers wrap gifts after their flight or ship them ahead of time to avoid the possibility of having to open them during the screening process. TSA Pre✓® is an expedited screening program that allows travelers to leave on their shoes, light outerwear and belt, keep their laptop in its case and their 3-1-1 complaint liquids/gels bag in a carry-on, in select screening lanes. Those eligible for TSA Pre✓® can participate at more than 180 airports, including Richmond, when traveling on a participating airline. If you are interested in enrolling in TSA Pre✓®, visit www.tsa.gov. Additionally, individuals who obtained TSA Pre✓® five years ago are now able to renew their TSA Pre✓® membership online. Thirsty flyers – bottled water: You can’t bring a bottle of water through the checkpoint, but you can bring an empty bottle through the checkpoint and then fill it up once you’re through security. Footwear: You’ll need to remove your shoes at the checkpoint, so wear footwear that is easy to slip on and off. Hold onto your hat – lost & found: People leave items in the checkpoint bins all the time. If you think you may have lost items at a RIC checkpoint, call 804-226-8585. Stay connected: If you are traveling with a laptop or other large electronic items, tape a business card or other identification on it so that if you leave it at a checkpoint, TSA can contact you to make sure you get it back. Customers at Richmond International Airport enjoy a state of the art, two-level terminal featuring upper level departures and lower level arrivals areas, spacious ticketing and baggage claim halls, a variety of restaurants and retail stores, and widened and improved security checkpoint portals. Business travelers enjoy the comfort and convenience of RIC’s Business Center, featuring meeting space, conference rooms and communication services. Other airport amenities include free airport-wide WiFi service, an Inter-Faith Chapel, full service banking and ATM facilities, free shuttle service between the terminal and economy parking lots, curbside taxi service, USO Center for active duty and retired military personnel, and a Visitor Information Center offering Richmond and regional information.